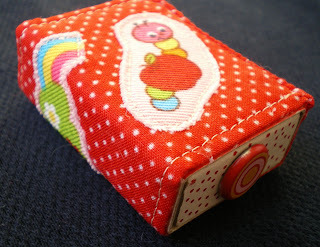 A matchbox for Mim. She has promised not to look so I can show pics. 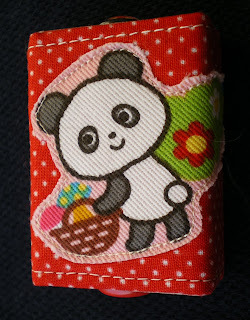 The panda is so cute he might make you gag, but he seems to like the red polka dot fabric he is appliqued to. Underneath is a worm who has his eye on an apple. I'm struggling a bit today. I picked up my new glasses and thought my headache would disappear, but instead it got worse. My new glasses feel very different and I think I might need some more time to get used to them. There is a much narrower field of vision, because the lenses are smaller than my last pair. Maybe one day, eighties style frames a la Tootsie might come back, and make graduated lens glasses more comfortable for all the old, blind, crabby people like me! omg. That is one fabulous matchbox. I have never seen one with actual stitching work. Awesome! So sweet. 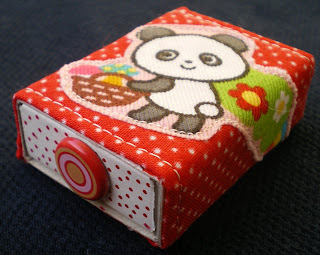 I love this little box! SAM! that is the cutest! Lucky Mims! Awww, thanks possums! Veging out sounds good, MG! Very sweet. I hope she doesn't peek & spoil her surprise. I'm so sorry for your headache, Sam! (I know what you mean about the smaller field of vision: I chose new glasses with smaller lenses--they're more stylish than my old ones, but I have to move my head around more to focus on the right thing in the right way.) In any case, I really hope you feel better soon.